BNP Paribas Open: Way Ahead of the Slams? Way Ahead of the Slams? Shot Spot will make Indian Wells the world's best officiated event. According to BNP Paribas Open spokesman Matt Van Tuinen, "Indian Wells is the most accurately officiated tournament in the sport." Now why would Matt make a claim like that? Have the officiating crews been handpicked and trained by new tournament owner Larry Ellison? Just kidding. 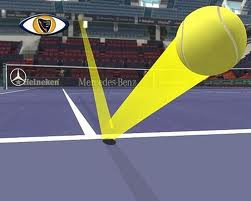 The real reason is that for the first time anywhere on the tour every match on every court�including all the outer courts--will have the shot spot so any player in any round can challenge any call�not just the players on the large stadiums. That's a world first. You don't see it at Wimbledon or the Open or in Paris or Australia. But maybe that is about to change. Can the Slams let Indian Wells top them in the long run? We reported last year about Oracle founder, billionaire, and bon vivant Larry Ellison's acquisition of the event and though the tournament people are reluctant to talk about him or his influence, it's a pretty safe bet he is the driving force here�remember this is the guy that single handedly changed the America's Cup through advanced technology. Larry likes to set the pace. But shot spot isn't the only thing that is changing this year at the fabulous Tennis Garden. And yeah I repeat my question from last month: are you there? 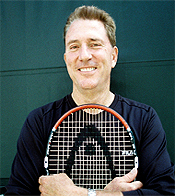 Larry Ellison: jumping into tennis at the top. All the match courts are now lit�and they have improved the illumination on the two smaller stadiums. Sadly they have also ripped out the two har tru courts, but they have added 4 lighted practice courts in that spot behind the soccer field where the international players like to show off between matches. They also added more bleachers and viewing platforms on the two show practice courts. That's good because when the big boys practice those courts get 5 or 6 deep and people get pushy. Trying to get close to Rafa a couple of years ago a fan got her leg caught in one of the picket fences that used to lead to the soccer field, fell and took the fence with her. Rafa escaped unscathed. Maybe the extra courts and the bleachers will take it back more toward the old days when you could stand on the veranda in the front row overlooking Andre Agassi or Pete Sampras practicing in the spring sun. OK that won't happen, but it should help. I guess people really read the articles I write�because every year thousands more show up. Kidding again. New practice courts could eleviate the crush to see top players up close. Larry had nothing to do with this but one of the other exciting new things this year will be the young players Matt Cronin wrote about last month. (Click Here.) They would be Alex Dolgopolov, Milos Raonic, and Bernie Tomic on the men's side, and Wimby sensation Petra Kvitova on the women's. But some things thankfully will be the same at Indian Wells. Our fabulous team for one thing, with Giancarlo Andreani, Aaron Martinez, Matt Barrett, and Susan Kraft all filming in various formats, resolutions, and speeds to keep the Tennisplayer.net visuals the best anywhere for the player who really wants to study the game in all dimensions. 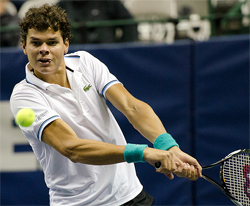 Milos Raonic: some big results and some even bigger hype. And yeah Robert Lansdorp is back again as "special correspondent." I never know what will be on Robert's mind or what might come out of his mouth, but it will be something, we know that for sure. Sullivan's Steakhouse: Very lively scene, great bar, friendly waitresses, great cocktails, great steaks, great crabcakes, great wedge salads, and killer hot bread. Forget about the stone crabs though�that's a Miami only deal no matter what they say. If you are on your own, it's a good place to eat in the bar. We used to go to LGE's too--the prime steakhouse icon�after all that's where Andre and Steffi go when they are in town�but last few times the meat (which is massive in size and priced accordingly) just wasn't that great, to be honest. Some one email me if they have corrected this please. 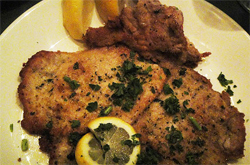 Castelli's: Castelli's is a joint, in the best sense of the word, a great Italian joint. They have pictures of Sinatra like he was a patron�actually he was never there, but it doesn't matter. The waiters have been there forever and wear tuxs, sometimes a little beat up around the edges. They serve great old style Italian dishes that snooty trendy places won't touch. Retired guys with Bentley's and Cougar's (not the car) abound. 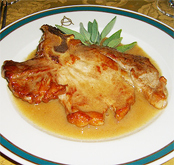 The pounded veal chop kills. So does the grilled version. As do the lobster tails. Let yourself go and have a fettuccini side order and spumoni for desert. The pounded veal job at Castelli's. Mama Gina's: And here is the trendier more upscale Italian to balance out your Castelli's experience. Food is more sophisticated�not sure it's better but again great long time waiters. The other big draw here is voyeuristic. Lots of players dine here. We watched Ivan Ljubicic (surreptitiously of course) eat with his family and entourage the night before the final last year. (Luby had one glass of wine�maybe that was the key to victory.) But the funniest and most bizarre thing I've seen in a desert restaurant was one of the tour photographer's swooping in the second they left, sitting in Luby's chair and basically eating the scraps from his dinner. Now that's entertainment value. Armando's: Fun, high quality casual Mexican. Sit outside if it's really warm at night�rare but possible in the desert in March. Susan Kraft our still photographer demanded we add a Mexican option last year. OK Susan, Armando's was it. But my beloved wife Isabel who was visiting (she never comes for the whole thing) and is from Guatemala, put her stamp of Latin restaurant approval on it as well, and that is not easily earned. Great margaritas, with designer tequila available by request. Second they put out the home made chips in quantity with great salsa. I hate myself when I eat two baskets myself. Tamales are great. All the other classic stuff too. Chile verde, mole, etc. Le Vallauris: very French French. Matsuri Sushi: You don't (or shouldn't) think of the Indian Wells area as a prime location for seafood, let alone raw fish. But we have had consistently tasty food at this spot in a non presupposing strip mall location. But that wasn't why we first went there. You guessed it. Player stalking. Giancarlo found it and sure enough. Max Mirni with his wife and kids. 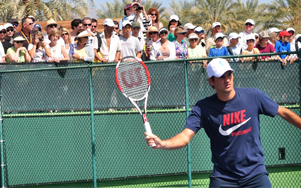 Tommy Haas. And strangely the Spanish players�no we didn't see Rafa. So it's a fun tournament insider place and I have to say the sushi was just fine. The rolls especially. Le St. Germain: And now for those of you who relentlessly seek superior dining regardless of location or cost. This is a bitching French restaurant. Formal, gorgeous, quiet. With attentive service from the moment you walk in. It's not for everyone. If you aren't looking for super high end delicious food in a relaxed ambiance with the (justified I thought) super high prices that go with it�don't go! But if what I have written intrigues you, you'll love it. Le Vallauris: And so we reach the outside edge of the envelope. This place is a trek�you gotta drive to Old Palm Springs�do yourself a favor and talk Highway 111 all the way about 40 minutes. The food is the equal of Le St. Germain, though maybe a little more old style French, so I think it's worth the drive. (Again not if you are cheap about your high end dining.) But what you also gain for your drive is a different world. No tennis players here. And an amazing garden setting. Make sure and sit outside. Somehow they made these gorgeous white trunked trees grow together at the top to form a natural roof. These guys know food and if you are knowledgeable and appreciative they'll be glad to see you and vice versa. So enough about food and back to all the people who took the time to email me and say they are coming�and a lot for the first time�after reading the article and the email last month. As I said, you won't be disappointed. I don't plug many things on Tennisplayer, but I do plug things I believe in. Like the frickin' fun at this event. I probably gave about 50 people my cell number and said call and say hi. So just do me a favor and remind me who you are when you call, especially if we haven't met. 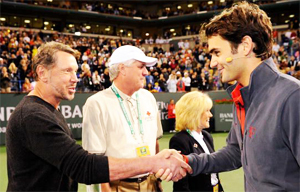 We always like to meet the human beings that make Tennisplayer possible!